Cruise line connoisseur, family travel expert, destination guide guru — it’s safe to say Kimberly Tate from Stuffed Suitcase wears many hats. Whether she’s sharing helpful tips on Vacation Mavens Family Travel Podcast or exploring the world with her two daughters and husband, Kim believes all globetrotting goals are possible, even with a family in tow. So, of course, it was a no brainer to hear more about her Celebrity Cruises Caribbean vacation with scenic stops in St. Maarten, St. Thomas and Puerto Rico. She agreed to give us insider’s look so you too can maximize a #MomAndMeAtSea vacation this summer. Hey, Kimberly! Thanks for joining us. Tell us about yourself, Stuffed Suitcase, and how you got into travel blogging. My husband is actually the one who jump-started the idea of travel blogging for me. He saw how friends and family would often ask for my advice and tips when planning their own vacations and recommended I look into blogging. After that seed was planted I dived into reading numerous books about blogging and decided to give it a try. I started the blog in 2012 while still working a part-time job and being a stay-at-home mom. Soon I discovered that I wanted to grow the blog and treat it as a business so in 2013 I quit my part-time job and went all in on blogging. It’s taken a few years to determine my voice and focus, however I feel confident now that Stuffed Suitcase can truly help families plan where to go next and offer tips to help them travel smarter. I want to inspire families, especially women, to create amazing memories that will be remembered for a long time to come. If you asked me this question five years ago I’d probably label myself as a Type-A traveler. I liked to know in advance what the daily plan was, where we were headed and how we were getting there. Thankfully my husband has opened my eyes a bit to enjoying the trip with a bit of spontaneity and I’ve found that wandering occasionally offers some gems of discovery. Now we like to have a plan but allow plenty of downtime for either relaxing or finding something we didn’t have planned. You’ve got quite the team of adventurers! What makes traveling the globe as a family so special? I love how travel can help you truly see your children’s personalities. It’s such a delight to see how they react to new sights and foods. To get to hear what they think of things or learn new facts they never would have learned before makes traveling together so much fun. Even when the travel hiccups come, which trust, me they do come, we have the opportunity to solve issues together and act as a team. You recently embarked on a #MomAndMeAtSea journey with Celebrity Cruises. Who did you bring along with you and what were your favorite activities together on the ship? Our Celebrity cruise was a mother-and-daughter solo trip, I embarked with my youngest, 11-year-old Mia. I’ve found that these one-on-one trips can be great as the girls get older since it offers special bonding time with just one of my daughters at a time. Each of my girls are different and when we travel together it’s fun to share in adventures that are shaped by their interests and personalities. I asked Mia what her favorite three activities were and two of them were with me! Her first choice was getting manicures together in the spa, second choice was our snorkeling adventure in St. Maarten. Adults need to let loose and enjoy themselves too! What were some of your noteworthy adults-only activities? I actually loved getting coffee and sitting on my veranda to read. I found it extremely peaceful. I also enjoyed strolling around the upper decks, especially at sunset. There’s nothing quite like watching the sun dip below the ocean horizon from the deck of cruise ship. I also took part in a watercolor class that was fun and educational. It made me wonder about doing some watercolor travel journals on trips with my girls. You and your family have enjoyed your fair share of cruise adventures. What made this one different from the rest? This was the first time we’ve cruised on a solo kid trip, our other trips have been with the whole family. After this trip I still think cruising is a great vacation option for families. Multigen families will love that cruising offers everyone the opportunity to spread out and do their own things, while still being able to come back together for shared meals or excursions. 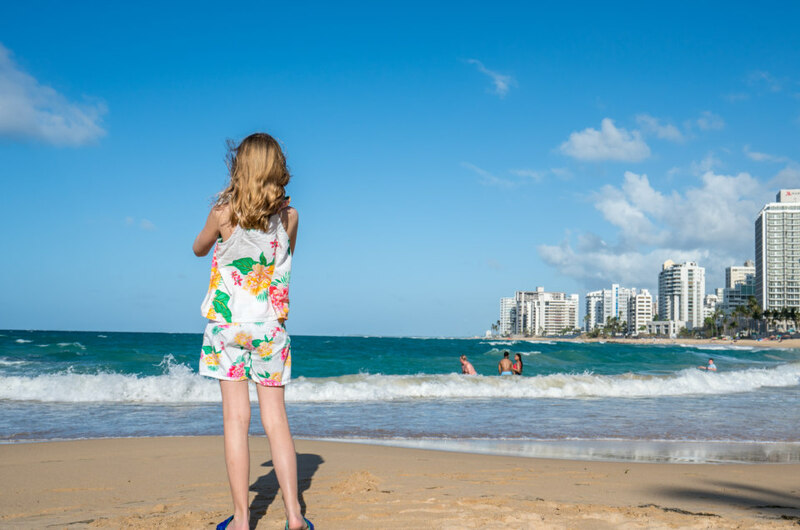 For mother-daughter trips, cruising is perfect since you can splurge a little more on special excursions and activities and there’s less “tug-of-war” over who gets to plan what we do next. There’s a lot of exciting stuff happening on and off board. How can families best prepare for maximum fun for both the kids and the adults? I think one of the great things about cruising is that you don’t have to do a lot of planning beforehand! I do think you should consider if you’re a foodie family and if so, consider a dining package and make some dinner reservations in advance. If you’re not foodies, then you might be content having your set dining time in the main dining room and enjoying the rotating menu discovering something new each night. For activities while on the ship, definitely consider what excursions you want to do at the ports and consider booking those in advance if you’re set on certain ones so you guarantee they won’t sell out. Also make sure to note any age requirements for excursions if you’re traveling with kids. Activities aboard the ship can be taken day by day and the handy daily schedule that’s dropped in your room each night is the perfect spot to find what’s happening around the ship. Then each person can just choose what they want to do and go their separate ways if they want. One of your stops included the beautiful, St. Maarten! Tell us about your excursion. We took a jeep tour excursion that included a beach stop. The beach stop was unexpected, but turned out to be fabulous. We rented a couple of chairs and a beach umbrella, and enjoyed the white sand beach while splashing in the beautiful turquoise blue water. After enjoying the beach for a couple of hours it was our turn to head out in the jeeps and drive around the island. We even had a stop at the famous airport beach where the jets land and take off right over your head. We heard you also explored life underwater with a sail and snorkel adventure in St. Thomas! How cool was that? We went on a snorkeling adventure to Buck Island. This excursion was probably one of my favorites because it challenged my daughter to overcome a fear. I hadn’t even considered that she might be scared of sharks (a fear of mine actually). As we headed into the ocean away from St. Maarten island she mentioned that she was scared to be going into the deep ocean and was scared there’d be sharks. My parenting instincts kicked in and I assured her that we were going to be safe and have fun. Our first stop was fairly clear turquoise water and she jumped overboard after I jumped in first. We snorkeled around together and spotted sea turtles, colorful fish, and even a sting ray, before heading back on board for our last stop. This time I decided to stay on the ship and get some photos from above and she went in alone with the guide to check out a sunken ship. Let me say that this water was much deeper and very dark and I had some of my own fears come to the surface, however she went right in and had a blast. I was so proud of her for doing something out of her comfort zone and then doing it again without me next to her. It was one of those awesome travel moments when you get to see your kids grow and smile big knowing you had a hand in it. You also made a stop in colorful San Juan, Puerto Rico. What was it like to explore the city? We started our exploration on a bus before heading back to the port and hopping on a boat to see the coastal side of Old San Juan. From the water we even saw the famous fortress of San Juan. After our water tour, we got to walk along the streets of Old San Juan, and that’s where we discovered the beautiful colors that characterize the city. Many of the buildings are so bright and I couldn’t resist snapping photo after photo of the narrow and colorful streets. We were lucky enough to be there for sunset and the way the golden light played off the colorful buildings made for some beautiful photos. 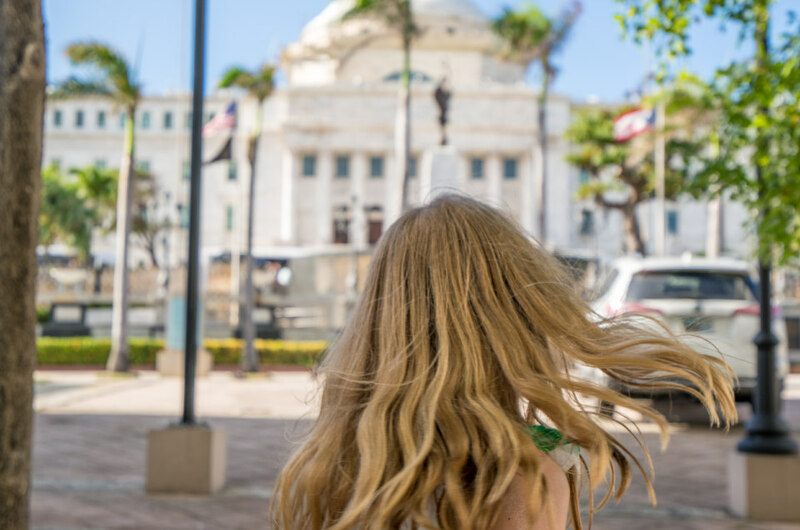 Mia loved discovering the street in front of the Governor’s Mansion where there are colorful flags hanging over the walkway. 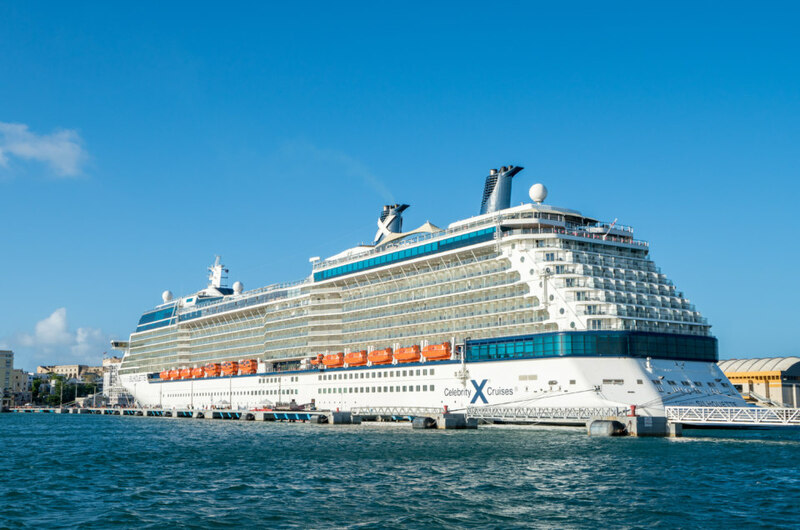 It sounds like you had quite the vacation with Celebrity Cruises! Do you have any tips to share with families looking to climb aboard? Families need to consider what type of room suits their needs. Verandas are a priority for our family because our girls are older, and the extra space allows some escape space while in our room. The huge wall of windows also helps bring in light and make the room appear a bit larger and open.